Hi, this morning Ric McIver picked up his nomination package and is working to collect the required signatures from current PC Party members to be a registered candidate. He will be travelling Alberta in the coming week to collect signatures, but is asking for your help in the process. Attached is a nomination form that you can print off and sign if you are 14 years of age or over. If you have purchased or renewed your PC Party membership since January 2014, please fill in the form, enter your membership number in the space provided and sign the form. Then scan it and email it back to info@ricmciver.com (cc’ed above). 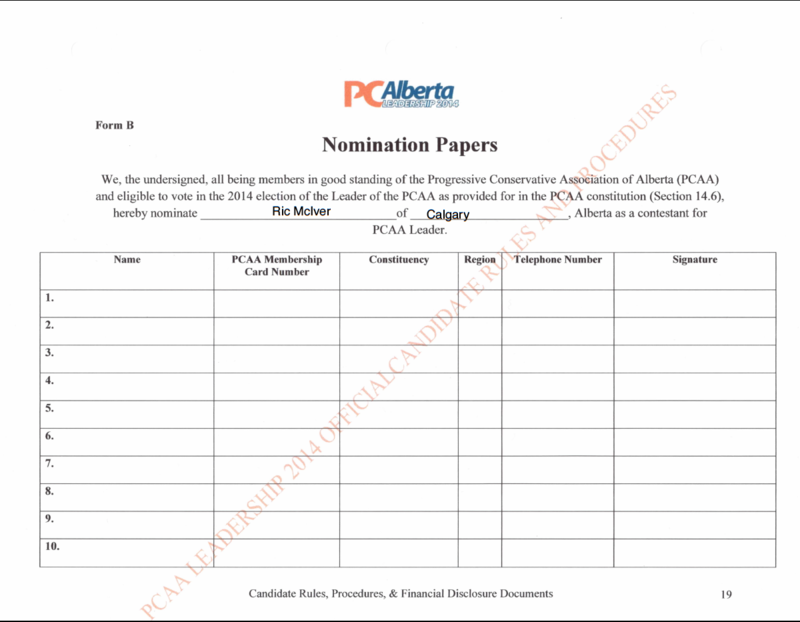 If you have not renewed or do not have a current PC Party membership, please go to https://www.pcalberta.org/become-a-member/ to purchase a membership online. You will not get a membership number but the Party will accept your signature if you purchase your membership online. Then fill in the form and sign it, scan it and email it to info@ricmciver.com (cc’ed above). If you have any questions, please feel free to contact info@ricmciver.com .